During Mark Twain’s time on the Mississippi, not only was he inspired to write Life on the Mississippi, but his experiences would also motivate one of his greatest novels of all time, The Adventures of Huckleberry Finn. 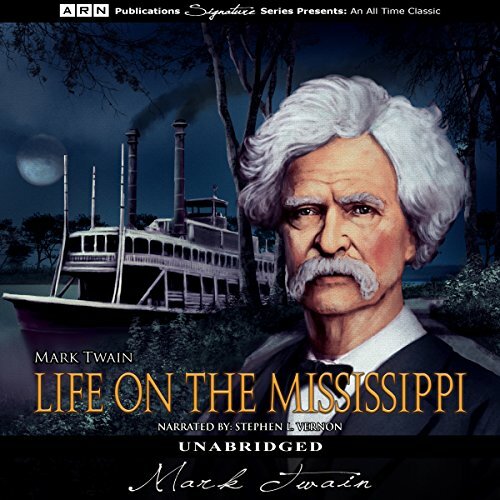 Life on the Mississippi is a first-hand account of river travel during the American pre-Civil War era and one of Twain’s finest works. The book is fine, although it is an expanded version of an excellent ARTICLE Twain first wrote for the Atlantic magazine. Thus, the padding is somewhat superfluous, albeit with interesting turns of phrase thrown in. I wonder if the recording had a producer/director who knew anything about the river or French names in the US. The narrator mangles several English words and practically every French name or term he reaches. Not just prood-HOMMY for 'Prudhomme, he also says **Lag-NAPPY** for 'lagniappe'? He does this with such glib confidence that I have to think he actually is proud of his community college AA. Furthermore, his slightly husky, self-satisfied intellectual tone would make you want to abandon the snack table if you met him at an amateur theater cast party. Could you see Life on the Mississippi being made into a movie or a TV series? Who should the stars be? With this narrator as a model, Fraser's younger brother. If you like the smell of a high school English teacher's breath after a smoke and a cup of coffee in the teachers' lounge as he talks over your shoulder while you are taking a quiz, this is the performance for you.